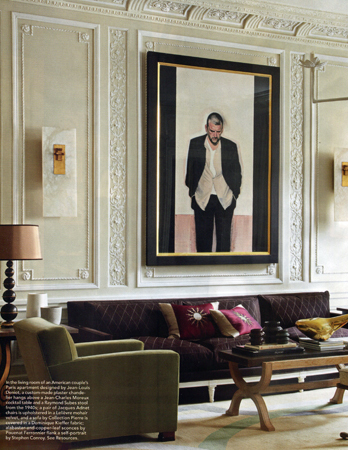 I can’t tell you how excited I was when I saw this Paris apartment in Elle Decor. 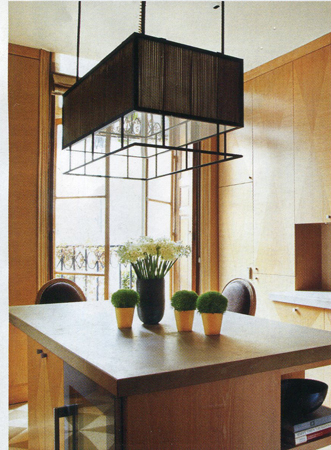 This pied-a-terre is located on the Left Bank near Saint Sulpice and was designed by JEAN-LOUIS DENIOT. 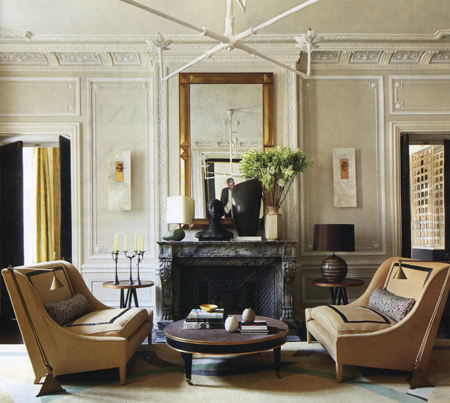 I’ve been a bit underwhelmed with lighting options lately, so I was immediately drawn to the alabaster and copper-leaf sconces by Pouenat Ferronnier flanking the artwork in the living room above. Also in the living room, notice how the 18th century details on the ceiling, paneling and the marble fireplace are in perfect balance with the modern sofas from Ochre. In the dining room, a table by Collection Pierre is gorgeous paired with Jean Royere chairs and a chandelier by Barovier and Toso. 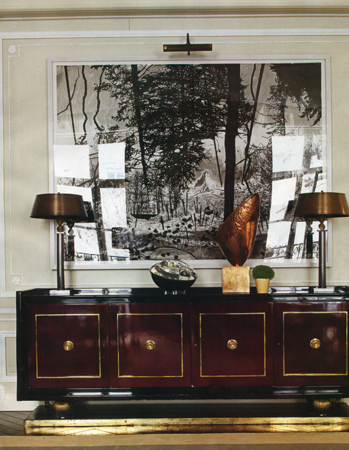 I also love the Herve van der Straeten sconces flanking the artwork here too. 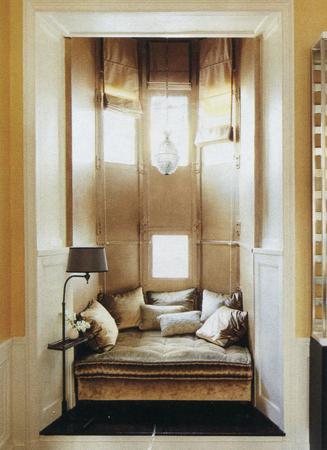 This plush little nook in the dining room is the perfect place to curl up with a glass of wine and a good book. Also, it’s a creative way to give purpose to an under-utilized space. 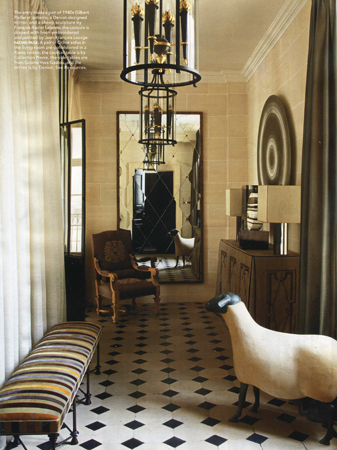 In the entry hall, I’m loving the Francois-Xavier Lalanne sheep sculpture. 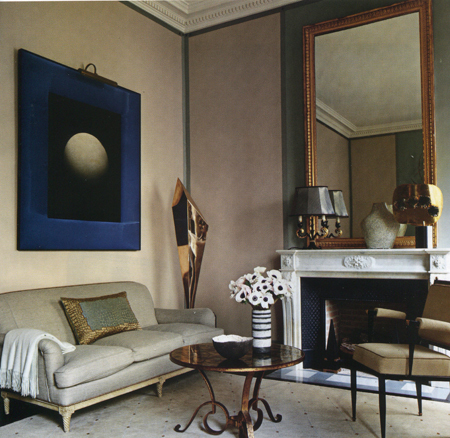 Since his death in 2008, I’ve noticed many contemporary spaces with Lalanne’s surrealist work as a focal point. Jean-Louis designed a very chic and very spare kitchen that speaks to the neat freak in me. I love that everything is hidden away. Yves Gastou in Paris specializes in 20th century furnishings and that’s where Jean-Louis found this incredible Gilbert Poillerat cabinet (love!!) and the André Arbus lamps. Probably my favorite room is the master bedroom. Clean, comfortable and luxe all in one! Due to the light cast throughout the apartment, Jean-Louis chose to use a taupe, khaki and blue color palette that helped create a cozy and inviting bedroom. 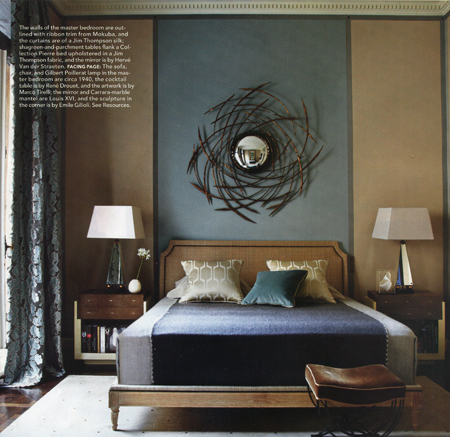 And a unique design trick was Jean-Louis’s use of Mokuba ribbon to outline the bedroom walls for that perfect mix of texture and pattern.